Striper Boats of Little Falls, Minnesota, for 2015 offers nine models of boats designed “for serious fishing…whether you’re 100 feet from the dock or 30 miles off-shore.” These nine models are available from twenty to almost thirty feet in Center Console, Dual Console, and Walk Around configurations. 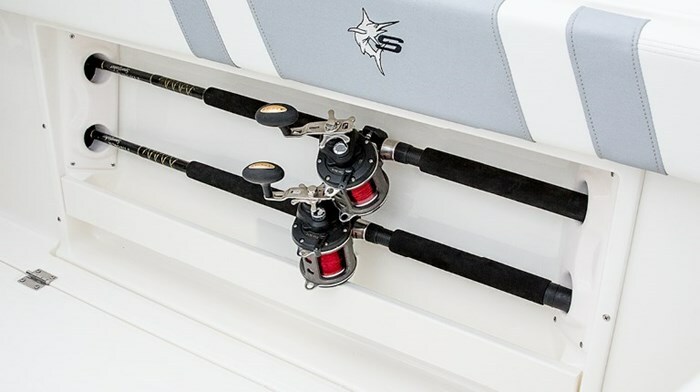 The Striper 200 DC (Dual Console) is one of the newest models and like the others, rides on Striper’s V Trac™ hull with a deep flared entry at the bow and a deep-vee 20-degree deadrise at the transom. This hull incorporates Striper’s patented one-piece Fibercore™ stringer system which is hand-secured to the hull for a more unified construction process to add support and to reduce vibration. Closed-cell foam is sprayed in every open space between the interior floor and hull bottom for increased impact resistance, greater noise reduction and a smooth, solid ride. 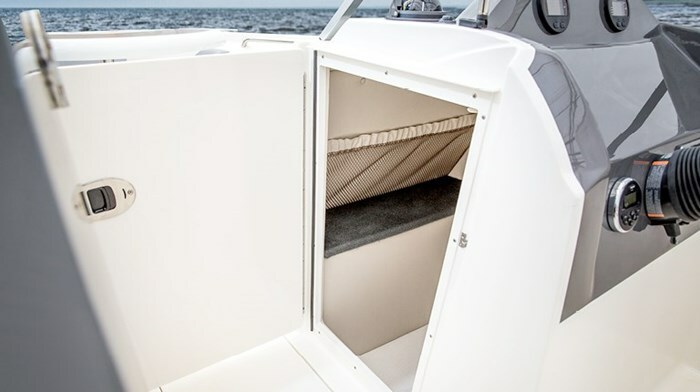 Again, like all Striper’s, the 200 DC incorporates a wood-free composite transom construction to prevent deterioration, rotting, or cracking and it is full width across the back of the boat to facilitate the mounting of aftermarket equipment. Also, like all Striper’s, the 200 DC is equipped with rigging tubes within the hull to facilitate additional wiring later on. The deck of the 200 DC is reinforced for mounting of a wakeboard tower. Two large fishboxes are provided port and starboard within the self-draining inner liner cockpit floor of the 200 DC plus an in-floor storage locker between the dual consoles. Both helms provide adjustable, high-back recliner pedestal chairs with armrests complete with storage netting built into the seat backs. A pair of stern jump seats with padded backrests are also provided with the starboard seatback on a pivot mount to facilitate easy access to the transom mounted swim ladder. 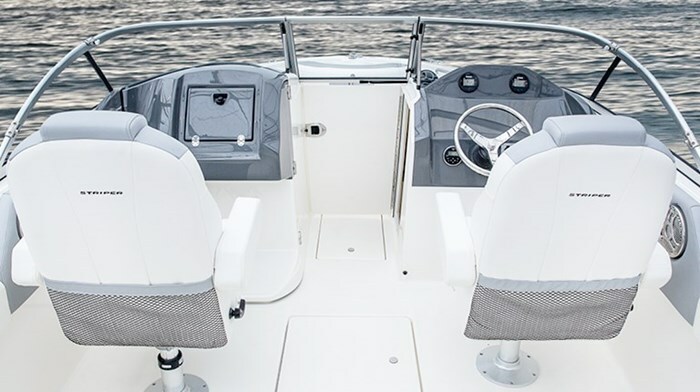 Through the centre opening of the curved windshield, the U-shaped bow cushions provide all-round seating with storage below the hinged bottom cushions. 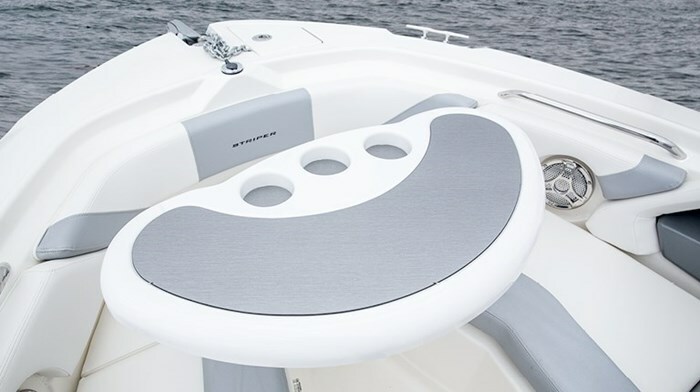 The centre bow seat cushion bottom is removable for easy step-up access to the bow which is complete with a recessed, covered bow access ladder plus an anchor roller and rope locker. Padded backrests on the forward side of each helm allow forward-facing lounging on these bow cushions. Full inner coaming upholstered padding is found throughout the cockpit and bow areas. Toe rails below the cockpit coamings add security when fishing and horizontal built-in rod holders in the cockpit provide handy rod storage. Both consoles on the 200 DC have a non-reflective grey finish and the driver’s helm is fitted with a tilting, stainless steel steering wheel with “spinner knob” and standard hydraulic steering. Standard instrumentation includes tachometer, speedometer, trim and fuel gauges and lots of room for your choice of flush-mounted electronics. A 12-volt receptacle is also provided. 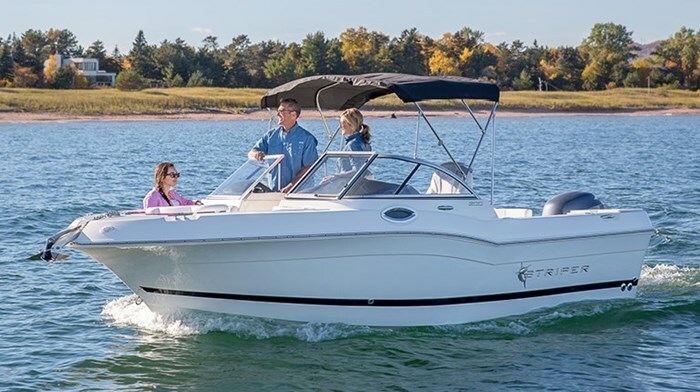 The passenger helm includes a lockable glove box on its front face which itself is an opening door to the built-in fiberglass head compartment complete with a porta-potti, solid top vanity with sink and storage below, and both natural and 12-volt lighting. Power for the 200 DC is available from your choice of Evinrude, Honda, Mercury, Suzuki, or Yamaha from 115 to a maximum rated 200 horsepower. Standard hull colour is white with graphics with optional hull colour bands available in black, blue, or grey. Interior upholstery colour accenting is your choice of tan or silver. Other notable standard equipment includes a port stern aerated livewell with high speed pick-up plus a cutting board. Raw water washdown is also standard equipment as is a Shoreland’r 5,000 pound galvanized trailer with disc brakes and a swing-away tongue. 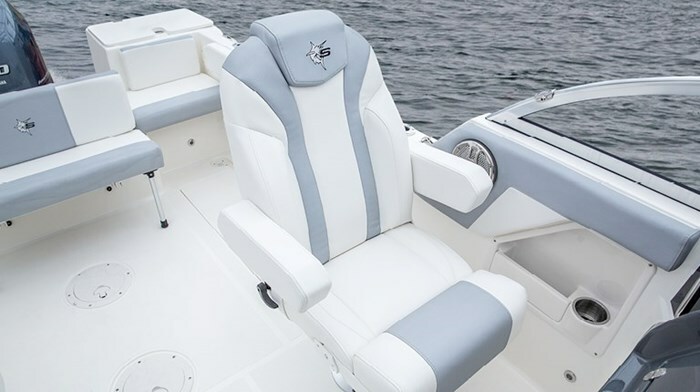 Notable optional equipment includes a fiberglass hardtop available in white, tan, or grey with or without outriggers. 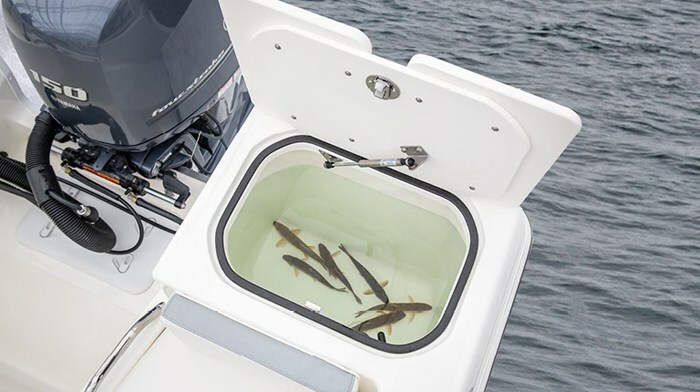 Also available is a centre stern flip-up bench seat or centre stern bait table, a semi-circular bow table with built-in drinkholders, bow filler cushion, Sea Grass mat or snap-in silver carpet for the cockpit, extended swim platform with or without kicker bracket and/or mat kit, fresh water washdown, transom shower, trim tabs, dual battery charger, anchor windlass, remote spot light, starboard and/or port windshield wipers, a Bluetooth compatible stereo with four speakers and MP3/iPod connectivity, a Raymarine E70 multi-function touchscreen package, plus various canvas covers to full enclosure with bimini top.